Sometimes, mini me doesn’t like the toys that she gets in her Happy Meal, so she hands them to me and tells me that they’re for her cousin, Hunter, whom she is really close to. There were two times that I had asked her if Mommy could have the toy she’s giving away and she agreed. Both of those toys were beanie babies, an octopus and a turtle. 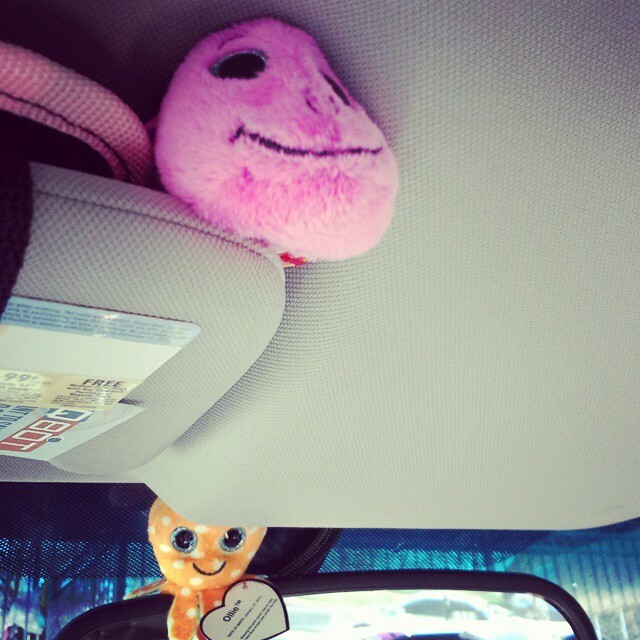 I thought they were cute and placed one above my rear-view mirror, and the other tucked between the roof and sun-visor. She loves my idea better than giving them away. For other One Word Photo Challenges, click here. This entry was posted in Photo Challenge and tagged animals, Arkansas, ASD, author, Author Jennifer Adams, author Jennifer N Adams, authors, Autism, Autism awareness, autistic children, beanie babies, blog, blogging, children, children with special needs, children's book author, creative writing, Happy Meal, humor, kids, McDonald's toys, one word photo challenge, parenting, parents, photo-challenge, photography, sensory processing disorder, single parent, single parents, SPD, Special needs, the daily post, toys, Weekly Photo Challenge on March 30, 2015 by JenniferNAdams.